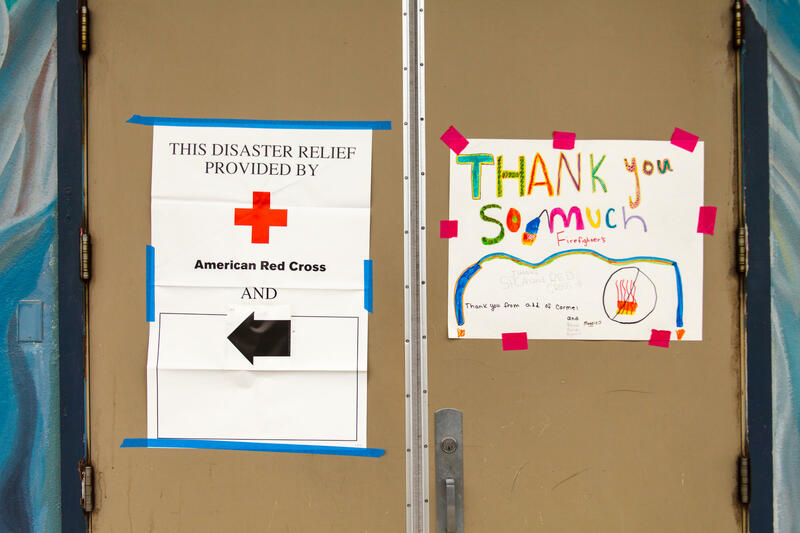 A Thank You Firefighters sign hangs on the door at the Red Cross evacuation center in Carmel. The Soberanes Fire continues to burn out of control southeast of Carmel Highlands in Big Sur. As of Monday morning, the fire has grown to 11,000 acres and is 5% contained. Six homes have been destroyed and the number of evacuation orders have grown. Jennifer Marshalek lives on the top of a mountain just outside Carmel Highlands. Since Friday she and her husband have fed firefighters and introduced them to the rugged terrain near their home. Sunday morning they were given five minutes to evacuate. “I grabbed my family pictures and said, Lord it’s yours. You know everything here is replaceable. You know, no one was hurt,” says Marshalek. Later at the Red Cross evacuation center in Carmel Middle School, she got word that the fire jumped her house. The Soberanes Fire is burning in a remote and rugged area of Big Sur. Hundreds of firefighters from around the state are helping fight the blaze. Crews are hiking into the wilderness to attack it from the ground. And from the air, helicopters are scooping water from the ocean while planes drop retardant and foam. 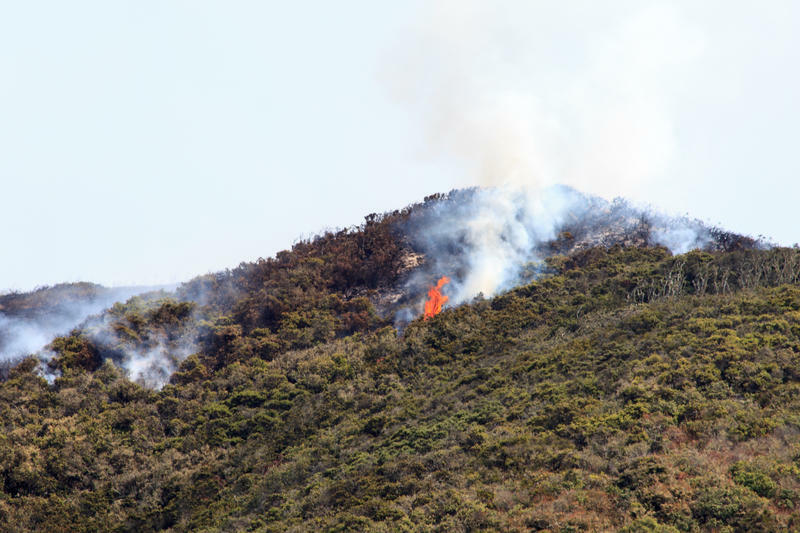 “The aircraft does a great job of slowing the fire, but we need the boots on the ground to get in there to actually put the fire out, and that’s part of the difficulty we are having right now,” says John Clingingsmith, a CalFire Public Information Officer. 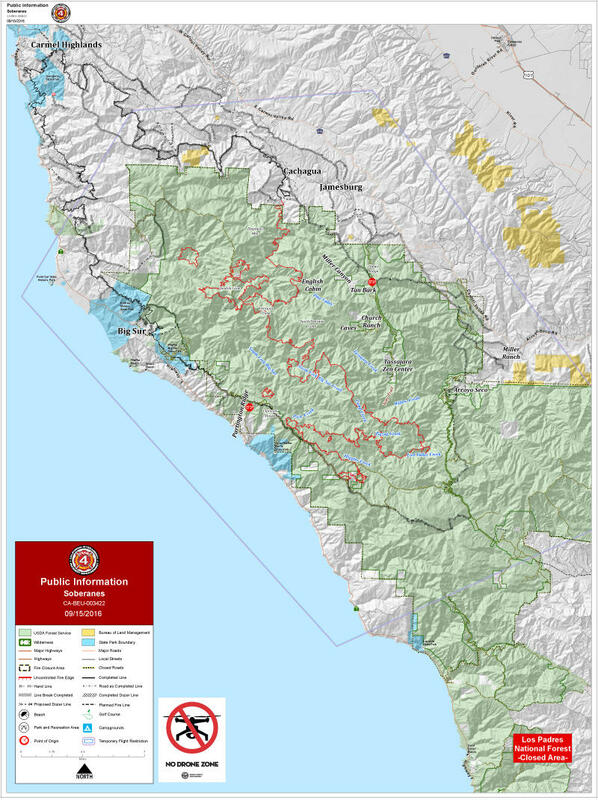 A mandatory evacuation remains in effect for the community of Palo Colorado in Big Sur as the Soberanes Fire continues to burn out of control. Carmel Highlands is under an evacuation warning. All residents are asked to be prepared to leave the area immediately. Twenty homes have been destroyed in the Soberanes Fire which continues to burn near Carmel Highlands and in Big Sur. As of Monday, the fire has grown to nearly 15,000 acres and is still just 5% contained. Soberanes Fire: Air Quality in Some Communities "Very Unhealthy"
The Soberanes Fire has left much of the Monterey Bay Area under a peachy haze. In many communities, it’s simply unhealthy to be outside. 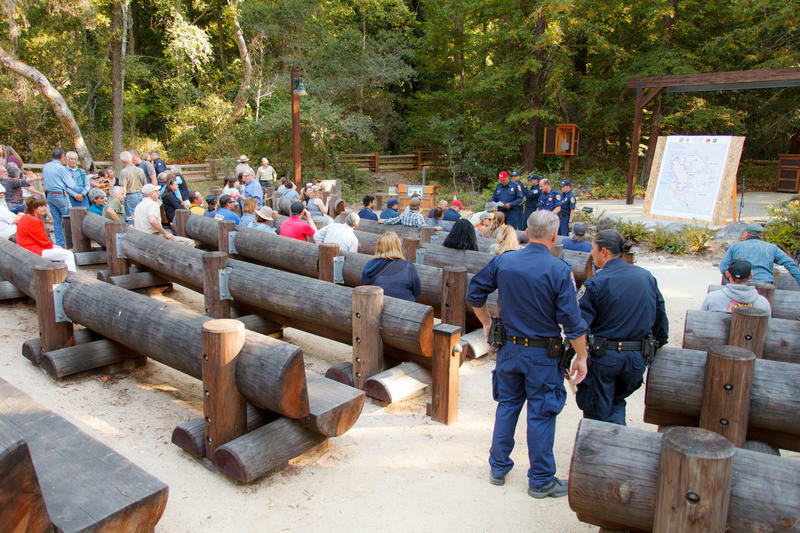 The Big Sur community gathered in an outdoor amphitheater on Wednesday night. They sat surrounded by towering trees at Pfeiffer Big Sur State Park. The beautiful scenery stood in stark contrast to the destruction of the fire not so far away. As helicopters fly overhead, a cloud of dark gray smoke rises into the sky. The sun appears red. But Steve Schuster stands in the driveway of his Cachagua home relaxed.